After running through running backs (see what I did there?) yesterday, I’ve gone to the trenches to discuss PFF’s advanced stats for offensive linemen. Hurries, hits and sacks allowed all come into play for offensive linemen, as does PFF’s pass-blocking efficiency metrics, which measures pressures allowed on a per-snap basis with weighting toward sacks allowed. The formula: 1 – (Sacks + Hits) / (2) + (Hurries) / (2) / (Total Pass-Block Snaps) * 100. All of which can be found in Premium Stats 2.0, which is made available to our ELITE subscribers. I’ll also highlight positive and negative run-block percentage, blocks charted as “beaten by defender” and pressure percentage allowed. Though such stats aren’t made available in Premium Stats 2.0, they’re often referenced in our articles. 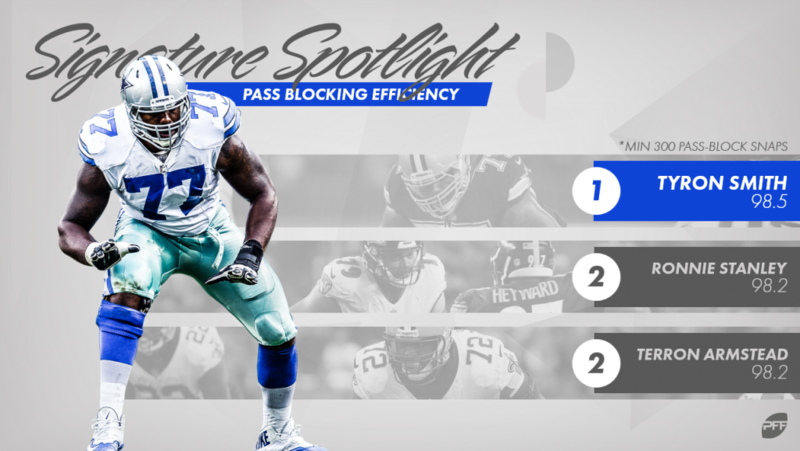 Dallas Cowboys offensive tackle Tyron Smith finished the regular season ranked first in PFF’s pass-blocking efficiency at 98.5. He allowed just 13 hurries, two hits and zero sacks across his 489 pass-blocking snaps. Only New Orleans Saints’ Terron Armstead played 300-plus pass-blocking snaps and allowed fewer pressures (11), but Armstead played 160 fewer pass-blocking snaps than Smith. On the opposite end of the spectrum, Los Angeles Chargers’ Sam Tevi, a second-year Utah product drafted in the sixth-round in 2017, struggled mightily in terms of pass-blocking efficiency. He allowed 41 hurries, 12 hits and eight sacks across his 483 pass-blocking snaps, good for a mark of 92.9. Only Oakland Raiders’ Kolton Miller (93.1) and Houston Texans’ Julie’n Davenport (93.2) came close to matching his disastrous performance in pass protection. As you’d expect, offensive guards, on average, have a much higher pass-blocking efficiency than tackles, and centers finish ahead of guards on average, as well. Cleveland Browns’ Kevin Zeitler and Philadelphia Eagles guard Brandon Brooks shared the league lead in pass-blocking efficiency (98.9) among qualifying guards during the regular season. Raiders center Rodney Hudson took the title for centers at 99.6, allowing just five total pressures (four hurries, one hit) across his 609 pass-blocking snaps. What doesn’t show up in an offensive linemen’s pass-blocking efficiency but does get reflected in his pass-blocking grade, are the plays where he gets beat by the defender. This is charted when an offensive lineman is beaten by his opposition, but the pass gets off before the defender can record a pressure. Here, Pittsburgh Steelers’ T.J. Watt puts Tevi in the spin cycle and is charted for being beat by the defender without allowing pressure because quarterback Philip Rivers gets the pass off quickly. This is one of the 37 times Tevi was beaten by his defender without allowing pressure, tying New York Giants’ Chad Wheeler for the league lead. Watt is also graded positively for this play but doesn’t add a pressure to his pressure total, which we’ll get into later in the Signature Stat Spotlight series when we dive into defensive linemen. Pressure percentage allowed takes the pass-blocking efficiency formula out of the picture and purely calculates how often an offensive lineman allows any type of pressure. For example, Baltimore Ravens rookie offensive tackle Orlando Brown Jr. tied for 10th in pass-blocking efficiency largely because he allowed zero sacks, but he ranked tied for 17th in pressure percentage allowed because he allowed 16 total pressures (15 hurries, one hit) across his 342 pass-blocking snaps. Going away from the passing game, another advanced stat we’ll sometimes reference in articles and have used in previous draft guides is positive and negative run-block percentage. The formula: (Positively Graded Run-Block Snaps) or (Negatively Graded Run-Block Snaps) / Total Run-Block Snaps). On every run play of every game, every offensive lineman on the field receives a +/- grade from -2.0 to +2.0. Any play where he’s given a grade greater than 0.0, it’s charted as a positively graded run-block snap and vice versa. Denver Broncos guard Connor McGovern recorded a positive grade on an NFL-high 15.5% of his run-block snaps in 2018, and Cowboys’ Zack Martin recorded the league-low negative run-block percentage (7.9%). Martin also led all qualifying guards in positive run-block to negative run-block ratio (1.54), another stat we can pull from the positive and negative run-block charting. Indianapolis Colts rookie sensation Quenton Nelson also impressed with his third-ranked 1.36 positive to negative run-block ratio. Here, Nelson pulls around, gets his man and drives the Miami Dolphins defender out of the play and into the turf. The extracurricular activity/wheelbarrow attempt by the (obviously upset) Dolphins defensive lineman doesn’t get graded, of course.